You will begin your 1st day on the National Mall. Including a trip INSIDE the United States Capitol Building. Then you will be off to discover every monument and memorial you could possibly think of seeing. Your 2nd day takes you to the home of George Washington. After Mt. Vernon, you'll be on your way to Arlington National Cemetery where you'll see the Changing of the Guard Ceremony and pay your respects to John F. Kennedy. Your 3rd day takes you through the museums. You'll see the powerful and sobering Holocaust Memorial Museum. You'll enjoy watching the money get made at the Bureau of Engraving and Printing, and you'll see the ORIGINAL Constitution in the National Archives. Your breakfast, lunch, and transportation is taken care of EVERY day. Your guide picks you up from your hotel with warm bagels, fresh cut fruit, coffee, orange juice, apple juice and bottled water every day. - Complete Tour of the Mount Vernon Estate including the Mansion of George Washington which has been meticulously restored to the way it looked at the time of his passing in 1799. 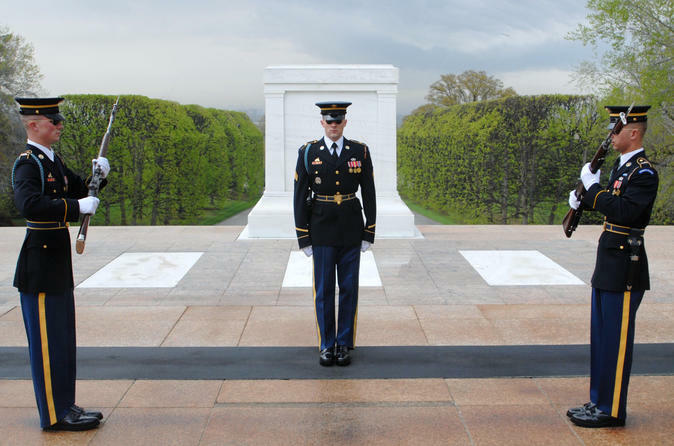 - We will also go to Arlington National Cemetery where we will witness the changing of the guard at the Tomb of the Unknown Soldier. You will also see the grave of John F. Kennedy. You will begin your 1st day on the National Mall. Including a trip INSIDE the United States Capitol Building. Then you will be off to discover every monument and memorial you could possibly think of seeing, and you also get a boat ride up the historic Potomac River. Your 2nd day takes you to the home of George Washington in Mt. Vernon, Virginia. On the way there you will ride through historic Alexandria. Once on the Mt. Vernon estate you'll walk through the mansion which has been restored to the way it looked in 1799. You'll take in a 4D movie. When it snows in the movie, it snows in the theater! After Mt. Vernon, you'll be on your way to Arlington National Cemetery where you'll see the Changing of the Guard Ceremony and pay your respects to John F. Kennedy. Your 3rd day takes you through the museums. You'll go inside the most beautiful building INSIDE in Washington DC, the Library of Congress. You'll see the powerful and sobering Holocaust Memorial Museum and see the atrocities committed by the Nazis. You'll enjoy watching the money get made at the Bureau of Engraving and Printing, and you'll see the ORIGINAL Constitution in the National Archives. Your breakfast, lunch, and transportation is taken care of EVERY day. Your guide picks you up from your hotel with warm bagels, fresh cut fruit, coffee, orange juice, apple juice and bottled water every day. Let us take care of everything and make your visit to Washington DC perfect!